Medical students are future health-care professionals who are invested with the responsibility of restoring health and well-being in the society. They should be role models to the public. Therefore, it is essential to improve their health-promoting lifestyle behaviors right from their initial days in a medical school. Health education in the university is regarded as an ideal means for teaching healthy lifestyles. It is because the students at this stage are in a unique step of knowledge absorption and personality shaping. Our previously published reports had focused on the observations of lifestyle practices among medical students. It revealed that health responsibility, physical activity, nutrition, spiritual growth, interpersonal relations, and stress management play a vital role in influencing the health status of an individual. It further encouraged us to plan an appropriate educational intervention to address these factors. Therefore, the present study was designed to evaluate the health status, i.e., body mass index (BMI) and waist–hip ratio in the undergraduate medical students before and after providing a multidisciplinary educational intervention. The present observational study was conducted on the 1st-year undergraduate medical students. The convenient sampling method was employed to recruit the participants. After obtaining the informed consent, 177 students (74 males and 103 females) were included in the study. The students who refused to give informed consent or were absent during the study were excluded from the study. The study was approved by the Institutional Ethics Committee (325/2015). Before the educational intervention, the height, weight, and waist and hip circumferences were measured. The BMI and waist–hip ratio were calculated using the standard formula. The students were then categorized from underweight to obese based on the standard classifications of BMI. The educational intervention was designed in the form of lectures, demonstrations, role play, and video presentations involving different disciplines such as medicine, yoga, physiotherapy, dietetics, and applied nutrition [Figure 1]. The interactive sessions covered topics such as general guidelines for a healthy life, balanced diet and nutrition, importance of regular exercises, health hazards, awareness about consulting a physician, and importance of yoga and meditation for a healthy life. Demonstration of yoga was also conducted to encourage the students to implement the same. It was carried out in four interactive sessions of 2 h each for 2 months, i.e., November and December 2015. Three months after the completion of the intervention, the same measurements, i.e., height, weight, and waist and hip circumferences were measured, and the BMI and waist–hip ratio were calculated. The data were recorded and analyzed using SPSS version 16 (SPSS Inc., Chicago, IL). The BMI, waist and hip circumferences, and waist/hip ratio before and after the educational intervention were compared using a Paired t-test. The comparison between the male and female students was conducted using independent sample t-test. P ≤ 0.05 was considered statistically significant. Hundred and seventy-seven 1st-year undergraduate medical students (74 males and 103 females) participated in the study. The pre- and postintervention findings of BMI, waist circumference, hip circumference, and waist/hip ratio were tabulated [Table 1]. Among them, the BMI, hip circumference, and waist/hip ratio when compared showed the statistically significant difference (<0.001), while the waist circumference did not show any significant difference. The difference in the BMI and the waist/hip ratio among the male and the female students when compared did not show any statistical difference. The BMI calculated was also used to categorize the student population into four groups: normal, overweight, obese, and underweight. The individual with a healthy BMI found a rise after the educational intervention (44.6%). Further, the obesity among the student population also observed a marked reduction (29.8%) [Figure 2]. These unhealthy practices and their consequences extend into adulthood, jeopardizing individuals' health status in later life. If these methods are identified and changed at an early stage, then the effects of health risk factors among adults are avoidable. Therefore, it is essential to increase healthy lifestyle behaviors among young people. The educational intervention planned in the present study was shown to improve the health status of the undergraduate medical students involved. The BMI, hip circumference, and waist/hip ratio measured before and after the intervention showed a statistically significant difference. Further, the categorized BMI indicated a gradual increase in the population of individuals with healthy BMI and decreased in the obesity after the educational intervention. However, the people with overweight and underweight found a rise postintervention. It may be due to the reduction in the weight and their shift into the category of lower BMI. Studies conducted on medical students at a university in Northwestern Saudi Arabia indicated that 34.5% of the students were overweight and 10.3% were obese. 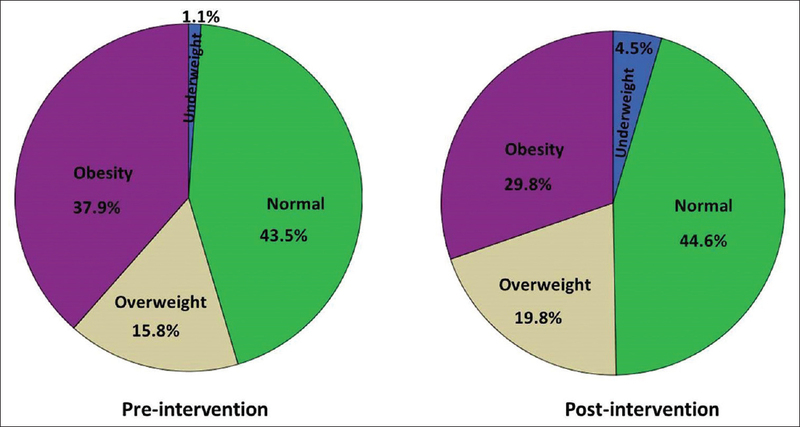 In addition, in a study estimating the occurrence of overweight and obesity among the Malaysian medical students, it was identified that 14.8%, 15.9%, and 5.2% were overweight, preobese, and obese, respectively. These were cross-sectional studies, and the findings were recorded without involving any educational intervention. In the present study, before the educational intervention, it was identified that 43.5%, 15.8%, 37.9%, and 1.1% were normal, overweight, obese, and underweight, respectively. After the intervention, the findings were 44.6%, 19.8%, 29.8%, and 4.5% for normal, overweight, obese, and underweight, respectively. Lifestyle behaviors in younger age may have an impact on lifestyle-related disorders in the future. The health hazards among adults can be prevented from identifying the practices and rectifying them at an early stage. Increasing the awareness of healthy lifestyle habits among the youth is therefore essential. The present study agrees with the same. Studies have also shown that implementation of interventions at worksites caused substantial mean weight loss and improved cardiometabolic risk factors. Similar observations were made in the present study, wherein the BMI and waist–hip ratio showed a significant improvement followed by the implementation of the educational intervention in undergraduate medical students. In a study carried out by Hsiao et al., a significant increase was observed in the total and subscale score averages of healthy lifestyle behaviors. Furthermore, Yeh et al. reported positive changes in the lifestyle habits of students after providing an educational intervention. A systematic review carried out to determine the causative factors for overweight and obesity identified physical inactivity, stress, inadequate sleep, and consumption of junk food as significant contributors. The educational intervention planned in the present study targeted on these factors and created an awareness of them. It further helped to improve the health status of the individual. Studies by Can et al. suggested that all aspects of healthy lifestyle showed better results among the medical students than the students of a nonmedical curriculum. The better results may be attributed to the medical curriculum that instigates the students to adopt a healthy lifestyle. Difficulty in adjusting to a new teaching–learning environment and the type of food available in the campus may be some of the confounding factors for the study. Medical students are the future health professionals, and with a sound, scientific base and are indebted to serve the community. Sensitizing the students early in their courses will not only facilitate the better adoption of healthy lifestyles among themselves but will also play a significant role in influencing masses to adopt healthy lifestyles in future years. Education about lifestyle practice and its related health hazards is crucial for leading a healthy life. The present study endorses it and states that a multidisciplinary educational intervention helps to enhance the health status of an individual by improving the BMI and waist/hip ratio. It would further contribute to a medical student's role in promoting a healthy lifestyle. We are grateful to the first-year undergraduate medical students of Kasturba Medical College, Manipal Academy of Higher Education, Manipal, who have willingly consented to be part of this study. We also thank the faculty of MFIILIPE, Manipal, for their support and encouragement. Lowry R, Galuska DA, Fulton JE, Wechsler H, Kann L, Collins JL, et al. Physical activity, food choice, and weight management goals and practices among US college students. Am J Prev Med 2000;18:18-27. Landsberg B, Plachta-Danielzik S, Lange D, Johannsen M, Seiberl J, Müller MJ, et al. Clustering of lifestyle factors and association with overweight in adolescents of the kiel obesity prevention study. Public Health Nutr 2010;13:1708-15. Al-Khawaldeh OA. Health promoting lifestyles of Jordanian university students. Int J Adv Nurs Stud 2014;3:27-31. Mansor M, Harun NZ. Health issues and awareness, and the significant of green space for health promotion in Malaysia. Procedia Soc Behav Sci 2014;153:209-20. Wang D, Xing XH, Wu XB. Healthy lifestyles of university students in China and influential factors. Sci World J 2013;2013:412950. Salinardi TC, Batra P, Roberts SB, Urban LE, Robinson LM, Pittas AG, et al. Lifestyle intervention reduces body weight and improves cardiometabolic risk factors in worksites. Am J Clin Nutr 2013;97:667-76. Steptoe A, Phil D, Wardle J, Cui W, Bellisle F, Zotti AM, et al. Trends in smoking, diet, physical exercise, and attitudes toward health in European university students from 13 countries, 1990-2000. Prev Med 2002;35:97-104. Steptoe A, Wardle J. Health behaviour, risk awareness and emotional well-being in students from Eastern Europe and Western Europe. Soc Sci Med 2001;53:1621-30. Pandey AK, Kotian SR, Souza AD, Vishal K, Acharya RV, Guruprasad S. Lifestyle practices among medical students: An observational study. Adv Sci Lett 2017;23:1943-15. Gahagan S. Overweight and obesity. In: Kliegman RM, Behrman RE, Jenson HB, Stanton BF, editors. Nelson Textbook of Pediatrics. 19th ed. Philadelphia, PA: Elsevier Saunders; 2011. Irwin ID. The prevalence of physical activity maintenance in sample of university students: A longitudinal study. J Am Coll Health 2007;56:37-41. Rivera-Rivera L, Allen B, Rodrıguez-Ortega G, Ch×avezAyala R, Lazcano-Ponce E. Violencia durante el noviazgo, depresión y conductas de riesgo en estudiantes femeninas (12-24 años). Salud Publica Me×2006;48 supl 2:S288-96. Laska MN, Pasch KE, Lust K, Story M, Ehlinger E. Latent class analysis of lifestyle characteristics and health risk behaviors among college youth. Prev Sci 2009;10:376-86. Pender NJ, Barkauskas VH, Hayman L, Rice VH, Anderson ET. Health promotion and disease prevention: Toward excellence in nursing practice and education. Nurs Outlook 1992;40:106-12. Gall SL, Jamrozik K, Blizzard L, Dwyer T, Venn A. Healthy lifestyles and cardiovascular risk profiles in young Australian adults: The childhood determinants of adult health study. Eur J Cardiovasc Prev Rehabil 2009;16:684-9. Nöthlings U, Ford ES, Kröger J, Boeing H. Lifestyle factors and mortality among adults with diabetes: Findings from the European prospective investigation into cancer and nutrition-potsdam study*. J Diabetes 2010;2:112-7. Hu FB, Liu Y, Willett WC. Preventing chronic diseases by promoting healthy diet and lifestyle: Public policy implications for China. Obes Rev 2011;12:552-9. Reddy P, Rankins D, Timoshanko A, Dunbar JA. Life! In Australia: Translating prevention research into a large-scale intervention. Br J Diabetes Vasc Dis 2011;11:193-7. Krueger PM, Chang VW. Being poor and coping with stress: Health behaviors and the risk of death. Am J Public Health 2008;98:889-96. Allam AR, Taha IM, Al-Nozha OM, Sultan IE. Nutritional and health status of medical students at a university in northwestern Saudi Arabia. Saudi Med J 2012;33:1296-303. Gopalakrishnan S, Ganeshkumar P, Prakash MV, Christopher, Amalraj V. Prevalence of overweight/obesity among the medical students, Malaysia. Med J Malaysia 2012;67:442-4. Hsiao YC, Chen MY, Gau YM, Hung LL, Chang SH, Tsai HM, et al. Short-term effects of a health promotion course for Taiwanese nursing students. Public Health Nurs 2005;22:74-81. Yeh L, Chen CH, Wang CJ, Wen MJ, Fetzer SJ. A preliminary study of a healthy-lifestyle-promoting program for nursing students in Taiwan. J Nurs Educ 2005;44:563-5. Monasta L, Batty GD, Cattaneo A, Lutje V, Ronfani L, Van Lenthe FJ, et al. Early-life determinants of overweight and obesity: A review of systematic reviews. Obes Rev 2010;11:695-708. Can G, Ozdilli K, Erol O, Unsar S, Tulek Z, Savaser S, et al. Comparison of the health-promoting lifestyles of nursing and non-nursing students in Istanbul, Turkey. Nurs Health Sci 2008;10:273-80. Shrivastava S, Shrivastava P, Ramasamy J. Assessment of knowledge about obesity among students in a medical college in Kancheepuram district, Tamil Nadu. Prog Health Sci 2013;3:54-60.